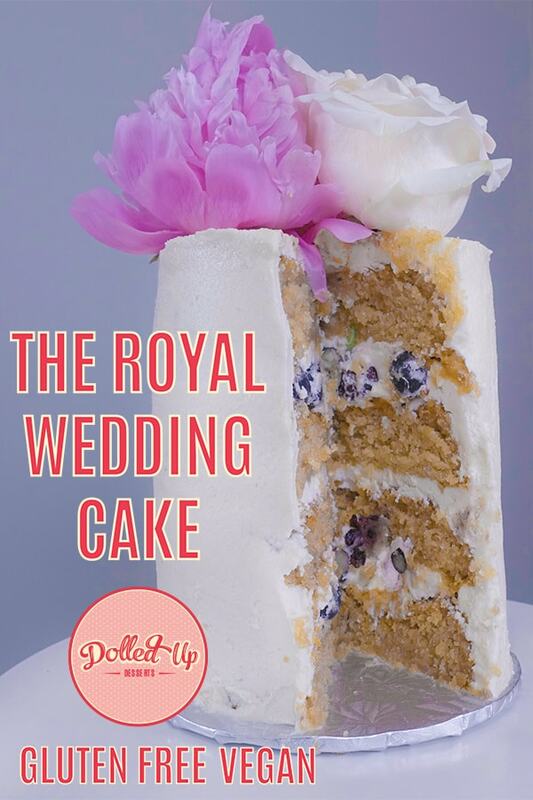 The Royal Wedding Cake is the ultimate cake to please Mum or a crowd with something fancy! Layers of gluten free lemon and elderflower sponge cake, iced with the most silky vegan swiss meringue frosting, topped with fresh spring flowers: peonies and white roses. Although it looks complex, the cake is super simples to bake! Confession time: I don't really follow anything royal family. I honestly think the fanfare over royalty is a bit much, since they really are only in that position because of tradition (which there probably was blood shed to get there). BUT when I heard the official flavour of Prince Harry and Meghan Markle's wedding cake, I dropped everything and tried to develop the recipe. It is totally up my alley, since we know I love creative flavour pairings. Get this: lemon and elderflower. I have never had elderflower before in my life, so what a perfect excuse to get baking! I've determined this is really the only way to get your hands on a slice of royalty as a commoner. You will even get to eat it before the guests, because this cake won't even be served the day of. It will be cut up into 4000 slices and sent around the world to thank guests.... but then be sold at auction for thousands of dollars. I'm still caught up at the fact that you can't eat cake at the wedding (why go even!). But the fact that the days old not- fresh cake is now priced ridiculously - forget about it! Make it yourself, impress your friends, or better yet, your Mom for Mother's Day. This cake will make her feel like a true QUEEN! I picked up the elderflower cordial at my local speciality food store, which is Pusateri's Fine Foods in the Greater Toronto Area (the Cloud Nine Vanilla Cake Mix used in this recipe is also sold there *wink wink*). However you can buy it online on Amazon or Ikea, surprisingly. But call ahead- my local Ikea's were sold out of it. Elderflower cordial has a very tart flavour at first, but then the floral notes hit you in that nose taste that is just MIND BLOWING! Paired with lemon, it made for a very complex, moist and delicate cake: perfect for our baking mix. Our vegan swiss meringue frosting was the perfect frosting for the job of enrobing the cake. Although the process of making swiss meringue is a pain in the you-know-where, it's whip cream like texture is just perfect for this moist and tart cake. I used lemon essential oil to flavour the icing, but you can also use extract in the same way. Don't be discouraged in making this kind of cake. It's pretty and professional looking, but YOU CAN DO IT! 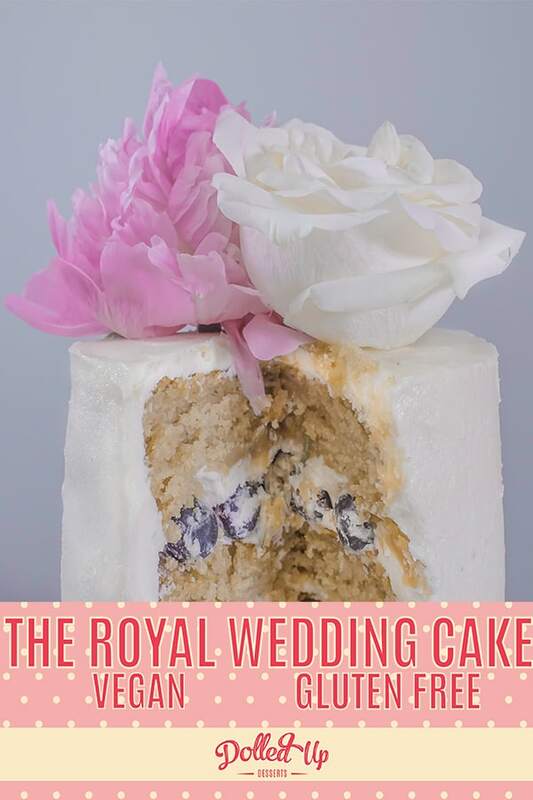 Practice makes perfect and with the right tools in hand, you will be spinning royal wedding cakes in no time! Last, when using fresh flowers in cake (which are absolutely stunning and the smells they give off while you eat are pure magic) , there are a few important things to do with the flowers so they don't poison your cake. 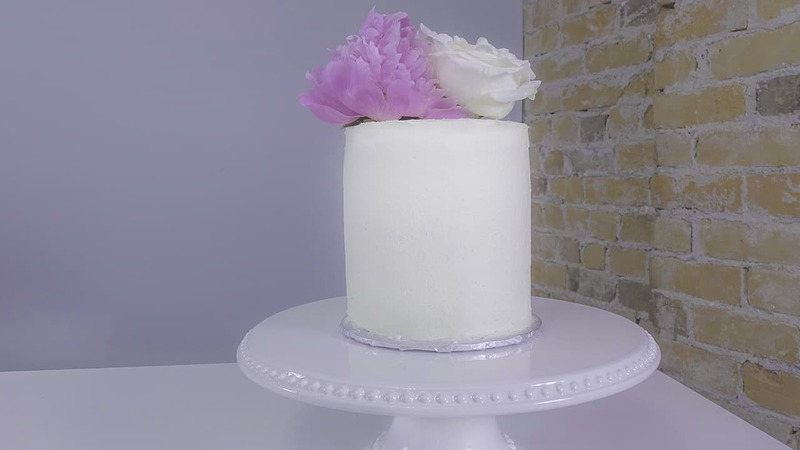 Check out this helpful guide to get you on the right foot to simple and beautiful cake decorating using fresh flowers. A most regal and delicate cake that captures the bright flavours of spring. 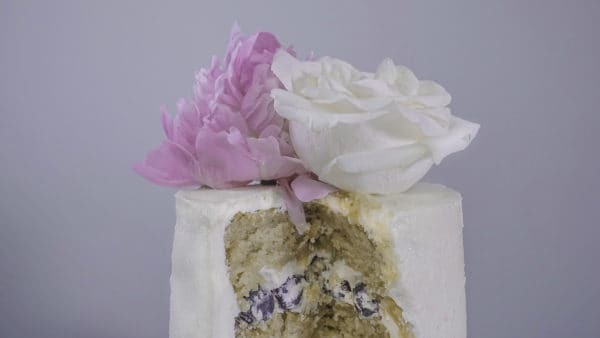 Sweet vegan lemon swiss meringue frosting enrobes a moist and flavourful gluten free elderflower and lemon infused cake, layered with fresh elderberries and blueberries, topped with a white rose and pink peony. Combine non-dairy milk, icing sugar, soy isolate protein and lemon flavouring in a bowl to create a lemon slurry. Set aside. Using a stand mixer, beat non-dairy butter on high speed for 2 minutes until fluffy. Place mixing bowl in fridge or freezer for at least one hour. We will rewhip this later. Preheat oven to 350°F. Lightly grease three 6" cake tins and place a circle or square of parchment paper in the bottom of each pan (does not need to cover entire bottom). If you have fewer tins, repeat this step for each cake layer. Combine non-dairy milk, lemon juice and elderflower cordial in a bowl. Stir and set aside. Combine oil, lemon zest and non-dairy milk/cordial in a bowl. Add baking mix and mix by hand using a spatula until all lumps are gone. Partition batter into cake tins filling them no more than 1 inch full. Bake cake for 20 minutes until the cake is firm to the touch. Once removed from the oven, carefully run a butter knife around the edge of the cake inside the tin to ensure it does not stick to the tin. Let cool completley. Remove cake from tins by placing a plastic wrap lined board on top of the tin, and flip the tin and the board over. The cake should fall out with ease. If desired, using a sharp knife remove the outer edge of the cake that has caramelized and hardened by cutting the edges away. Wrap cake in the plastic wrap and freeze cake for best results, approximately 1 hour. Remove frosting from freezer and let it come to room temperature. Rewhip the frosting on high speed. It will go through the three phases of vegan swiss meringue frosting again and end in a light and fluffy mayonnaise texture once again. Wet a piece of paper towel and fold it into a small square. Place in the middle of your decorating plate and put cake board on top. Dab and spread a small portion of frosting to the bottom of the cake board. Place first layer of cake on board, bottoms up. Pipe an even layer of frosting on the layer. 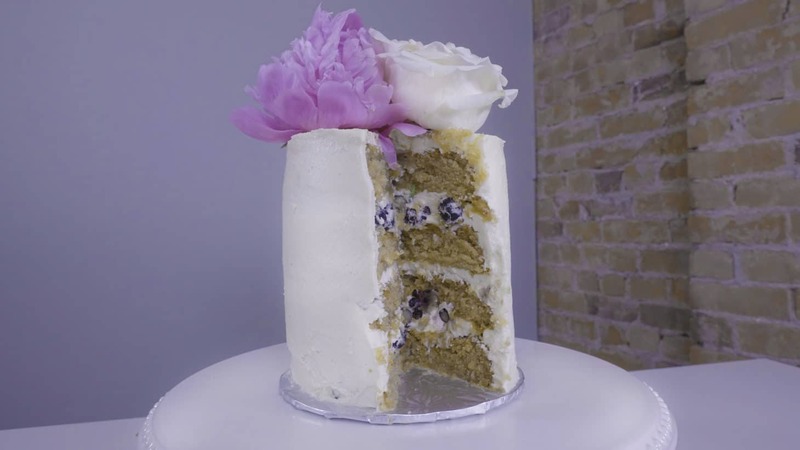 Press a handful of fresh berries into the icing, keeping berries closer to the centre of the cake. Pipe a small amount of frosting on top of berries and place second layer of cake on top. Repeat this step until the final cake layer is placed on top. NOTE: not all layers of cake need berries. Create a crumb coat: pipe icing liberally around the top and sides of the cake. Spread it to cover the entire cake using the offset spatula and smooth the icing using the smoothing blade. You want to place the blade at a 90° angle to the cake, keeping it as straight as possible and right on the surface of the cake as your spin the cake around. Level off the top of the cake edges by smoothing them over the top using the offset spatula. Once a thin layer has been set on the cake, freeze the cake for at least an hour, if not overnight. The more set the cake is, the easier it is to frost the cake later. Once the cake has solidified, remove it from the freezer and pipe an even layer of frosting along the top and side of the cake. Use the decorating plate to spin the cake as your pipe an even stream of frosting onto each surface. Cover the entire cake with one layer of piped frosting. Using the offset spatula, spread and smooth the icing to form one uniform layer. Use the icing smoothing blade at a 90° angle again to get that straight edge along the cake side. This can be tricky and requires practice, so don't worry if it is not perfect. Fold in the top edges of the cake using the offset spatula, and smooth the top last. Let it freeze again if desired to ensure the frosting remains untouched while decorating. Cut washed and dried flower stems to about 3 inches. Slowly press flower stems into the middle of the cake top until entire stem is in the cake. Take lots of pictures and post them to your Instagram story and Pinterest!! This cake can be frozen for up to 4 weeks or refridgerated for 4 days. Once cut and served, consume within 48 hours for optimal freshness. Have any questions or comments? Leave them below and let us know what you think! 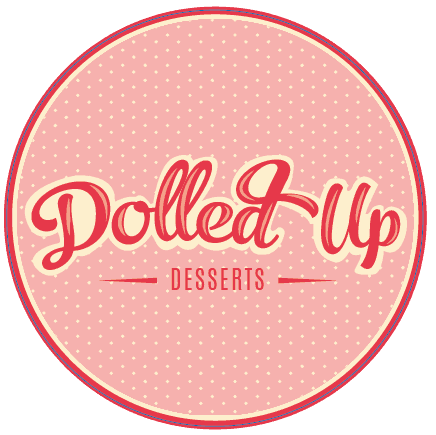 Be sure to share your creations on social media and tag us @dolledupdessertsbaking or #inclusivedessert!